"southern reconstruction cooking." never heard of it? well, familiarize yourself. because it's awesome. wishbone (two locations : lakeview & west loop) offers this southern reconstruction cooking. their website describes it as: "the style of contemporary american cuisine is steeped in the home-cooked table fare of north carolina, mixed with a dash of creole spice." since one location is walking distance from my house and the other is walking distance from my office, i've been to both ... for lunch & breakfast. my most recent trip was for brunch. 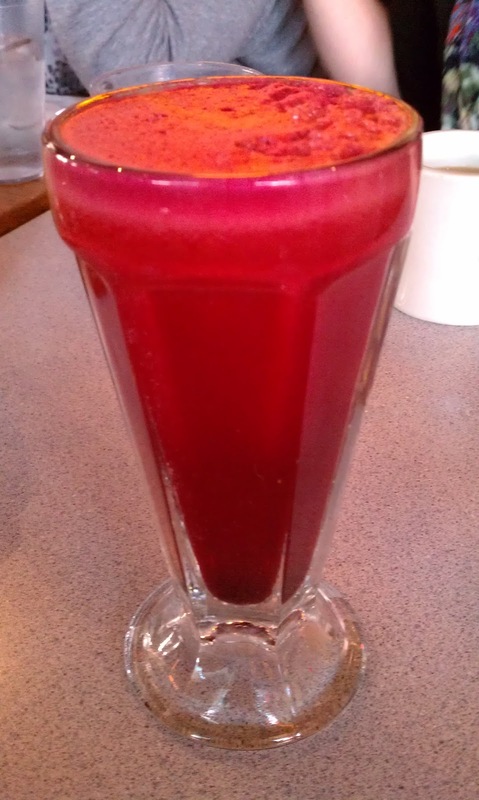 one of my favorite things about wishbone is that they offer fresh, house made juices. and a fresh, house made juice is just about my favorite thing in the morning (especially after a night of drinking). so ... um, yum? can you tell there is beets in this? ha. super fresh. super delicious. enough said. 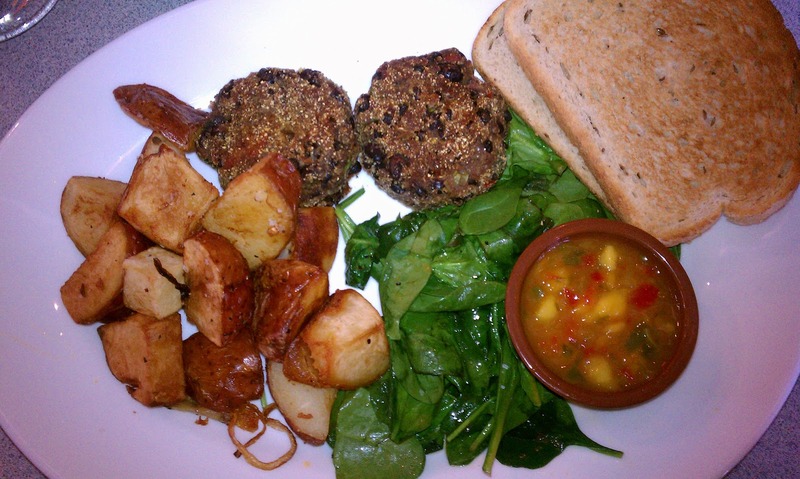 spicy vegan patties of black beans served with mango salsa, spinach, home fries & dry rye toast. i also got a side of avocado for good measure. this brunch was awesome. lots of variety in one meal, which i like. the black bean cakes are delish. maybe a smidge dry. but that's what the mango salsa is for, right? it was a bit sweet for me, but still tasty. the spinach was amazing. olive oil + lemon ... yum. the pots were great also. 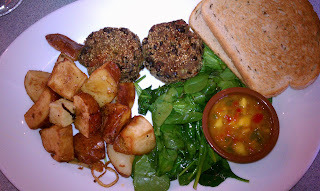 but potatoes and black bean cakes in one meal is a bit heavy. and obvi you can't go wrong with rye bread and avocado. i've never been to wishbone for dinner, so i can't speak to what they've got for vegans. but brunch, you're all set. a great place to get some delish breakfast-ish food. vegan eating in the news - again! schubas tavern & harmony grill.